"Something happens in this house, and no living soul knows what it is, for they who have seen it have never yet survived to tell the tale. It's not more than a week back that a young gentleman came here. He was like you, bold as brass, and he too wanted a bed, and would take no denial. I told him plain, and so did my man, that the place was haunted. He didn't mind no more than you mind. Well, he slept in the only room we have got for guests, and he—he died there." 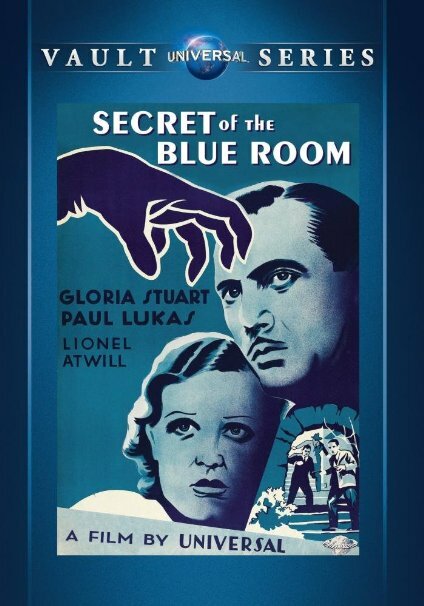 Secret of the Blue Room is a black and white movie thriller/detective from 1933 and was based on a German movie from the previous year, Geheimnis des Blauen Zimmers, which received two additional remakes by Universal – one as The Missing Guest in 1938 and the other as Murder in the Blue Room in 1944. The original remake of the German movie was considered to be a lost movie, before it apparently resurfaced some years ago and now you can even watch it on YouTube. 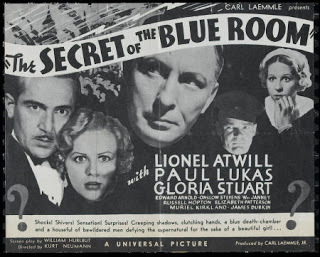 Secret of the Blue Room attracted my attention when reading a glowing review describing the movie as "a gem of a locked-room mystery" with a "tight-as-a-drum plot" that "doesn't have an ounce of fat to it and moves quickly." Well, that was all the encouragement needed to make this movie a priority and the first half was like seeing Carter Dickson's The Red Widow Murders (1935) or Helen McCloy's Mr. Splitfoot (1968) spring to life! The location of the movie is an old, medieval castle in the possession of Robert von Helldorf (Lionel Atwill), Lord of the Manor, who's hosting a birthday party for his daughter, Irene (Gloria Stuart), and invited three of her friends and potential suitors – Captain Walter Brinks (Paul Lukas), reporter Frank Faber (Onslow Stevens) and a young cub named Thomas Brandt (William Janney). They have a gay old time, playing the piano and singing songs, but when they sit down for drinks and cigarettes the conversation turns to the subject of ghosts. Lord von Helldorf is pressed by the party to tell the story of the Blue Room, which harbors a tragic and bloody history. Von Helldorf's sister and best friend died under peculiar circumstances in the Blue Room and suicide appeared as unfeasible as murder, because motives and means were lacking. A third tragedy happened when "a detective made up his mind to spend a night in the blue room," but in the morning they found him on the floor "with his face frozen in a look of agonizing horror." He had died of fright! The room was locked and remained unopened for twenty years. The three suitors want to prove their courage to Irene and decide to each spend a night alone in the murderous room, but the place lives up to its reputation and Brandt is the first to go. There was only key to the room and it was stuck in the lock from the inside. The open window had a drop of several feet and landed in a moat, but the body is not found and suicide is as unlikely as murder – just like twenty years ago! After having absorbed its first victim in two decades, the room truly awakens from dormancy and Faber is shot there while playing on the piano. A gun vanishes from the room after it was locked and Irene is attacked by a mysterious man, which is the point where they decide to call in the police – arriving in the form of Commissioner Forster (Edward Arnold). The questioning of the occupants and servants of the castle by Commissioner Forster is interspersed with vignettes from the servant quarters, populated by some enjoyable characters, before the room is being investigated and several traps are sprung – ending with a gunfight between the murderer and last remaining suitor inside the castle. Secret of the Blue Room is an unpretentious, well-paced compound of the thriller and mystery genre with elements of the classic horror story with its dark, wind battered castle, but robbed itself of a classic status by plundering the moth-eaten bag of tricks from the late 1800s for the explanation. 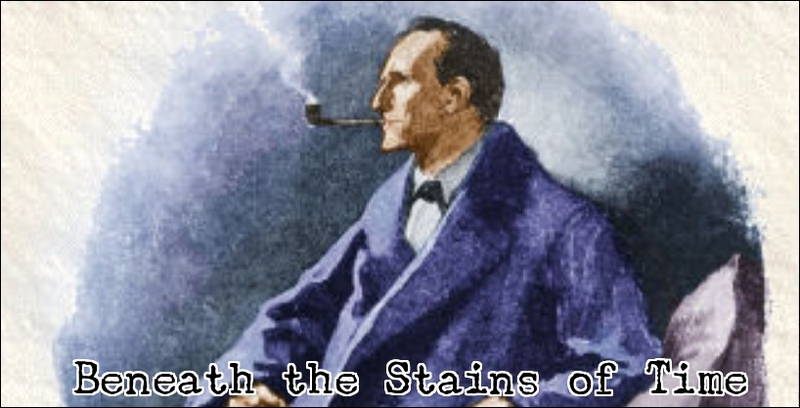 A seasoned mystery addict will recognize the bits and pieces borrowed from Conan Doyle's The Hound of the Baskervilles (1902) and "The Empty House," from The Return of Sherlock Holmes (1903), but the overall movie was too charming and fun to care about the punctuation marks that ended it. The plot may've been littered with old tropes, but the movie used them very well. So if you ever wondered how stories in the spirit of Wadsworth Camp's The Abandoned Room (1917) and John Dickson Carr's "The Devil's Saint," collected in The Dead Sleep Lightly (1983), translates to the screen... well... you'll be able to waste a fun little hour on this movie. "The past is but the beginning of a beginning, and all that is or has been is but the twilight of dawn." 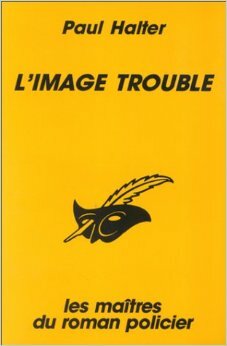 L'image trouble (The Picture from the Past, 1995) is the ninth Paul Halter novel published in English by John Pugmire's Locked Room International, which has become of inestimable value to incorrigible addicts of impossible crime stories – such as yours truly. The Picture from the Past is partially set in the last year of the 1950s and finds Chief Inspector Archibald Hurst of Scotland Yard, accompanied by Dr. Alan Twist, in pursuit of the notorious Acid Bath Murderer, before they recede into the background of the story. The lion's share of the book consists of a narrative divided between the past and present, which describe apparently unrelated events, half a century apart, but they begin to intertwine and betray some astonishing parallels as the story progresses. On the 1959 end of the story, there's John Braid and his newlywed wife, Andrea, who recently moved into their new home in the quiet village of Shapwick. John was able to afford to cough up the money their new home, but is as furtive about his job in the city as the respectable Mr. Neville St. Clair from Sir Arthur Conan Doyle's "The Man with the Twisted Lip," collected in The Adventures of Sherlock Holmes (1891), which is something that's eating away at Andrea. However, John has something else gnawing at his mind: an old photograph of a street in London from around the turn of the century. It evokes strong, unexplainable emotions. 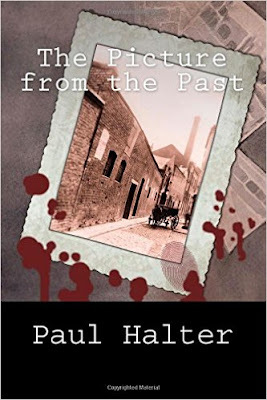 John even allows himself to be hypnotized by the shady owner of the local bric-a-brac shop to penetrate the mist enshrouded parts of memory lane, but they only manage to retrieve a few references to notes of music – and murder! The story-line that's set in the past is written in italic and focuses on the Jacobs family, which is torn apart when three men clad in black murder Mrs. Jacobs in the streets without an apparent reason. A senseless death that was prophesized by a local soothsayer and it wouldn't be the last death he foretold. As you might remember from past ramblings or my old review of the Jonathan Creek episode Time Waits for Norman (1998), I have a special interest in (impossible crime) stories that play around with the notion of space-and time – which Halter pulled off amazingly well for someone who's main flaw is often failing to create a sense of time and place for his (historical) settings. I loved how the echoes from the past began to manifest in the present story line, while the characters from the present discussed time travel, reincarnation, H.G. Wells' The Time Machine (1895) and newspaper reports of the elusive Acid Bath Murderer. I'd like to brag that I quickly caught on how the past storyline related to the present one, which was very Carrian in nature and much appreciated. As to be expected from its author and niche-publisher, The Picture from the Past contains not one, but two, locked room mysteries. In the storyline from the past, the fortuneteller, Jack Atmore, is found murdered behind the locked door and tightly shut window of his own home, but even more peculiar is the ominous letter he send himself – warning himself of his imminent death. The second impossibility is the baffling disappearance of John Braid from a partially locked-and watched set of rooms, but the solutions aren't breaking any new ground. It's even admitted in the explanation of the disappearance that's on old trick and the solution for the locked room murder was a trek across well-trodden ground. However, the locked room mysteries were only small side issues in a larger, over-arching plot that playfully combined two different narratives and toyed around with overlapping, parallel time-lines that managed to work in a serial killer plot in the background. Not everything is always perfectly executed or convincingly explained by Halter, but his imagination is something I have grown to admire. The characterization seemed sharper than usual in some characters, but that appeared to depend on their importance and prominence in the story. I have said it before, but I believe Halter severely handicapped himself by setting his stories in England. If I remember correctly, Le diable de Dartmoor (The Demon of Dartmoor, 1993) is the only Halter novel I have read to date that convincingly pulled off the English setting, but that was because he visited the location before writing the book. I think problems usually bugging his work, such as an unconvincing depictions of the historical settings and English characters with a Gallic flavor, would've vanished like a magician's assistant had they been set in France – something along the lines of a Henri Bencolin-style series reminiscent of early Carr. It would've gelled better with Halter's love for the grotesque. So, all in all, The Picture of the Past was an interesting treatment of a theme that even today remains largely unexplored and while the plot isn't picture-perfect (pun! ), I can't help but admire the effort at creating a complex, time-shattering mystery. I guess Dr. Twist summed up why I liked this story more than I should have: "you're also... attracted to the past, which fills you with nostalgia. In particular, you love the last century." Finally, I have to thank John Pugmire for his tireless work in getting these books translated and published... only to have sit there and hear us moan about some imperfections in the plot. Forgive us, John! And know that we're aware that you're spoiling us. "If the devil tells you something is too fearful to look at, look at it. If he says something is too terrible to hear, hear it. If you think some truth unbearable, bear it." 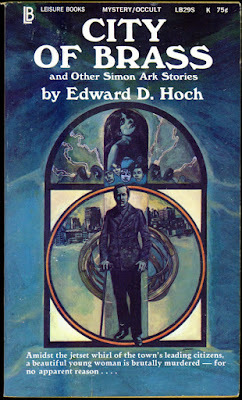 The late Edward D. Hoch was a giant during his lifetime as one of the most prolific mystery writers of short stories, which are the bedrock of the genre, and Hoch put nearly a thousand of them to his name – published in such magazines as Famous Detective Stories and Ellery Queen's Mystery Magazine. A number of popular series characters emerged form these stories, but, arguably, the most memorable and timeless figure from Hoch's cast of detectives is Simon Ark. Simon Ark appeared in Hoch's first short story, "Village of the Dead," in 1955 and was characterized over the years as a wandering soul, "searching the world for a long time, perhaps for centuries, in hopes of meeting the devil in combat," who may've been a Coptic priest in the early centuries of Christ – roughly 2000 years ago! City of Brass and Other Simon Ark Stories (1971) collects one novelette and two short stories, in which Ark detects and vanquishes a variety of evils. The first story in the collection is the titular novelette, "City of Brass," which originally appeared in the 1959 September issue of The Saint Mystery Library and it reminded me of the Wrightsville stories from the Ellery Queen series. The place where this short novel takes place, Baine City, is larger and denser populated than Wrightsville, but the flavor was similar due to the plotting being toned down in favor of the (religious) themes with a dash of characterization. 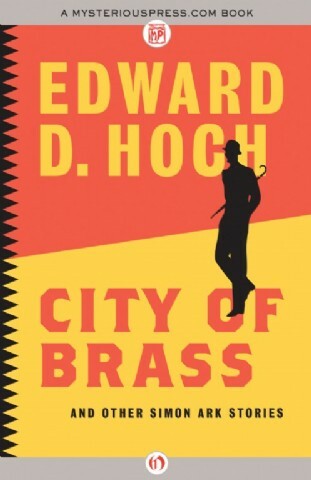 Baine City is an upstate New York town dominated and depended on a single industry: Baine Brass. However, it has made the city a prosperous and peaceful slice of America, which slowly comes to an end when rumors begin to circulate about sinister and unethical experiments at Baine University – carried out by Professor Wilber. The murder of a graduate student, Cathy Clark, seems to be connected to Wilber's experiments and possible motives and suspects are entwined in all of the social layers of the town. Ark investigates the murder alongside his nameless narrator over a Fourth of July weekend, which comes to a dramatic close at the funeral of the victim. I don't think the explanation will manage to surprise anyone who's consumed even half the amount of detective fiction that Hoch produced during his lifetime, but the fairness in clueing was appreciated and it was a nice, charming story to read. Once again, I recommend this novelette to fans of the Wrightsville novels by Ellery Queen (e.g. Calamity Town, 1942). "The Vicar of Hell" is the second story in the collection and was first published in Famous Detective Stories in August of 1956. The tale is set in London and concerns a lost tome, The Worship of Satan, published in the 17th century, but copies were confiscated and destroyed by the government. The volume discussed two suspicious deaths from 400 years ago, which are the poisoning of James Butler in 1548 and the sudden passing of Sir Francis Bryan – whom Oliver Cromwell once revered to in a letter as the Vicar of Hell. Three centuries has passed and a copy has resurfaced! However, the person wanting to sell the book was found murdered under circumstances that would draw the envy of the writers of Midsomer Murders: pinned against the wall like a cross with three arrows and pentagram scrawled in blood on the floor. Simon Ark and the nameless narrator are primarily occupied with tracking down a band of roving Satanists, which gives the story a trashy and pulpy flavor, but the hiding place for the book was genuinely clever and sidestepped the pitfall that usually befalls detective stories involving lost manuscripts – e.g. Edmund Crispin's Love Lies Bleeding (1948) and John Dickson Carr's The Mad Hatter Mystery (1933). I suspect this bit of the story was refurbished as a Nick Velvet story, because it's too perfect not to have used it for one of his thefts. The final story, "The Hoofs of Satan," was first published in Famous Detective Story in February 1956 and listed in Robert Adey's Locked Room Murders (1991), but it's not an impossible crime story. Obviously, the inspiration for this story came from an incident from 1855 in East and South Devon, England. A trail of hoof-like marks appeared after a snowfall and ran for miles, which even appeared in normally inaccessible places for none-winged creatures – such as on top of houses, narrow walls and enclosed courtyards and gardens. The hoof-marks in this story never perform any of those incredible feats, but form two lines coming and returning to the nearby woods. There presence is merely strange, but not impossible. The explanation is well clued and motivated, but hardly original and Hoch lessened some of the effect of revelation by revealing in the opening there would be a murder. That should've been part of the revelation and something the reader could have anticipated based on the hints. The 1855 incident was discussed in depth in Oddities: A Book of Unexplained Facts (1929) by Rupert T. Gould, which I reviewed here. 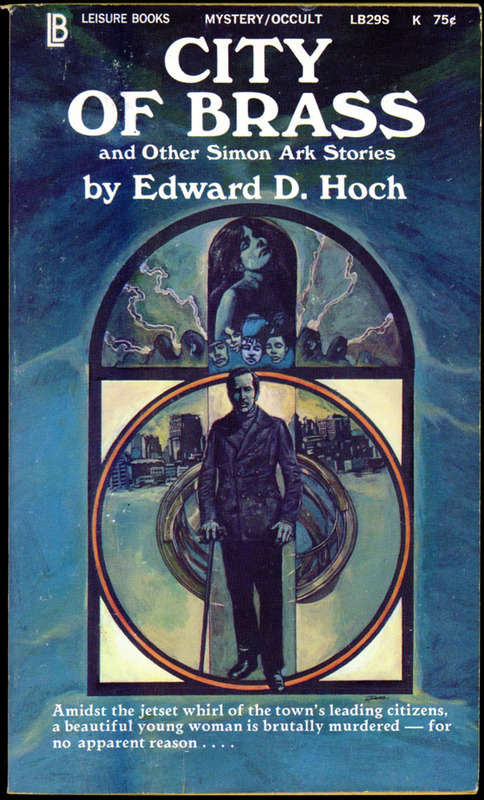 So, all in all, a short and decent collection of short stories, but not the best example of Hoch's talent as a mystery writing machine. On a final note, the next couple of reviews will also be of recent releases and include such writers as Yukito Ayatsuji, Paul Halter and Case Closed.